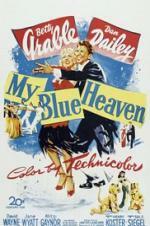 Buy or Rent My Blue Heaven (1950) Movie DVD & BluRay Online! Movie Plot: Radio star Kitty Moran, long married to partner Jack, finds she’s pregnant, but miscarries. For a change, the couple turn their act into a series on early TV and try to adopt a baby, finally acquiring a girl in a somewhat back alley manner. Complications follow amid a series of musical numbers.